WARNING! Disturbing images. Crab disassembly. Pictures of grody, gooey crab parts. The following is how I prepare Dungeness crab for cooking. I am not recommending that you do the same. There are other ways to kill and clean crab. Just don't cook them whole; that is truly yucky, and can be unhealthy. "I'm innocent! It was entrapment! No disassemble!" Turning salmon heads into crab. So the crab pot came up with some keepers in it. Yippee! There are several steps to check if the crab are keepers. They must be males. Females go back in the ocean to make more crabs. The crab caliper checks that they are of legal size. 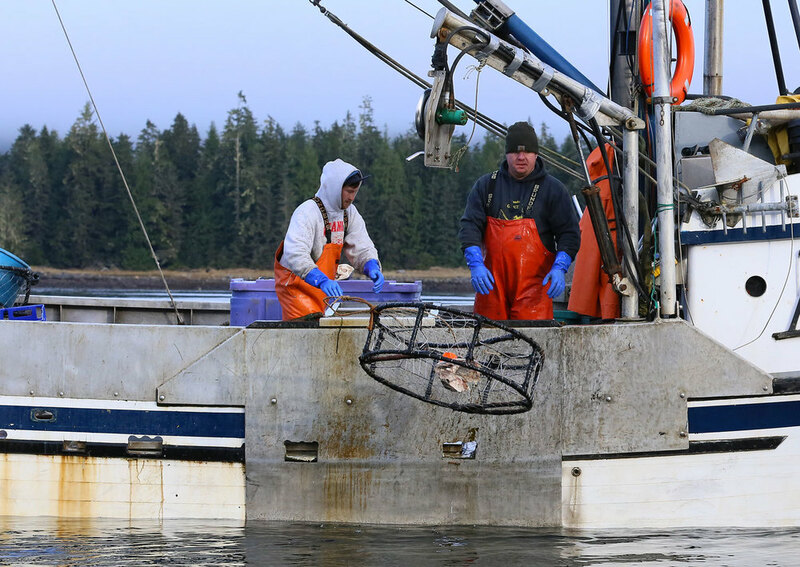 It goes inside of the point on each side of the crab's back to be sure that it is at least 6 1/2 inches across as per Alaska regulations. A quick squeeze on the large section of a leg behind the pincer tells if the crab is soft-shell. If the shell flexes then the crab has recently molted and will not have much meat. Soft shell crab are released to grow into their shells. The crab must be alive. Since I usually clean them within minutes of removing them from salt water it is easy to tell that they are alive; they are trying to escape, hang onto something, or grab my fingers. If the crab isn't moving, and its mouth parts are not moving then it is likely dead, which is not safe to eat, and an unpardonable waste. 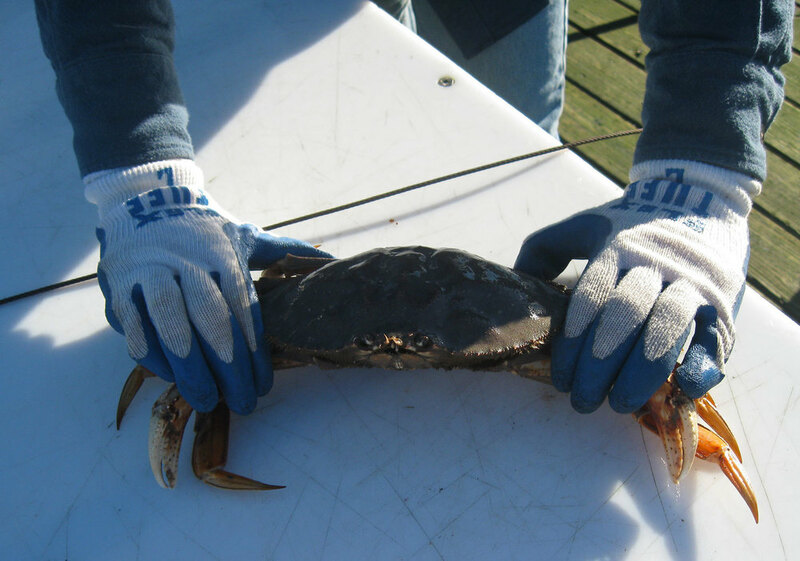 Dungeness crab are usually in a bad mood about being pulled from the water into outer space where they can't breathe. They are still quick, though, and will not hesitate to grab hold of fingers and bruise, break, or clip them off. I take this opportunity to thank the crab for it's life. Really. It is giving it's whole life, unwillingly, for my family's sustenance. The least I can do is give thanks and then make it's end quick. Okay, so down to business. I sneak up behind the live, feisty crab and get one set of legs in each hand. The crab doesn't think that this is a good idea and it takes a little convincing to get those pincer legs stretched out and grasped firmly while staying out of harms way. I wear gloves so that my not-so-delicate hands are not abraded by the crab's sharp exoskeleton. Keeping the pinkies out of the way. This is the ugly part, now. I bring the forward part of the carapace (back) hard against a corner, such as the corner of the boat, or in this case, the corner of the cleaning table. That pulls the back off of the crab. Right after that I push my thumbs into the 'belly' of the crab, pulling down on the legs and breaking the crab in half. That usually takes the fight right out of them. Flippant comments aside, this can be done quickly to minimize the creature's suffering. I pull the back off and pull the two body halves apart. Hanging onto the legs, I shake the viscera into the water. Shaking the crab guts out. Crab innards, aka crab butter, may contain paralytic shellfish poisoning (PSP). It is not safe to eat crab butter! Besides, eating crab guts is gross and disgusting. PSP will not be in the crab meat. The gills are still attached to the crab sections. They may be cream colored, brown, or grey. It is easy to pull the gills and mandibles off. I usually give the shells a quick going over with a scrub brush to remove any mud that may be caught in the corners. A good rinse is the last step before cooking. The Dungeness crab gills need to be removed. A final rinse removes any yucky bits. This post is about cleaning crab, so I'll just give a few quick notes about cooking. Cooking crab has its controversies: steamed vs. boiled, fresh water vs. salt water. The only for-sure thing is that the crab needs to be cooked immediately and well. I keep it simple. I bring a large pot of water to a boil, add the crab sections, quickly bring it back to a boil, and time for 17 minutes. But who am I kidding? That man, the love of my life, usually handles the crab cooker. I just make sure that there is melted butter to dip the crab meat in.